I was resisting joining Instagram at first because it meant spending time on yet another social media network in addition to Facebook and Twitter. At first I joined so that I could follow photographers I like. Then I started following other blogs I enjoy. Then I decided that I may as well start using it more actively. So when I see something that strikes me and I whip out my smartphone to capture it, I now often share it on Instagram. 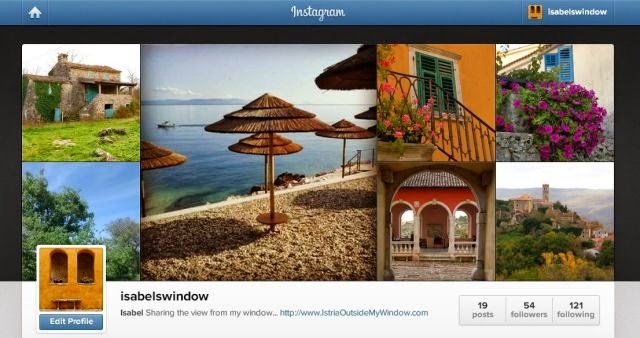 So if you would like an almost daily peek of life through my window in Istria, follow me on Instagram. I don’t have a top-end smartphone (it’s more bottom-end) so the quality of the photographs is not great and nothing like what my DSLR produces. But some of the colours and spirit of the places I shoot are captured. The images I share on Instagram are mostly of the lovely Istrian houses I come across, the nature, flowers and landscapes I see during my walks, the South Indian cat of course, and there’s also a huge fish head I came across in the woods. Curious? Check out my new Instagram page!